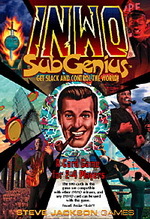 "...and you can complete your Illuminated library with the addition of the Prescriptures of the SubGenius! That perfect complement to your Necronomicon and Principia Discordia! It contains True and Detailed Predictions of These Last Days!" "All this can be yours when INWO-SubGenius comes out!" Yes, it's true. 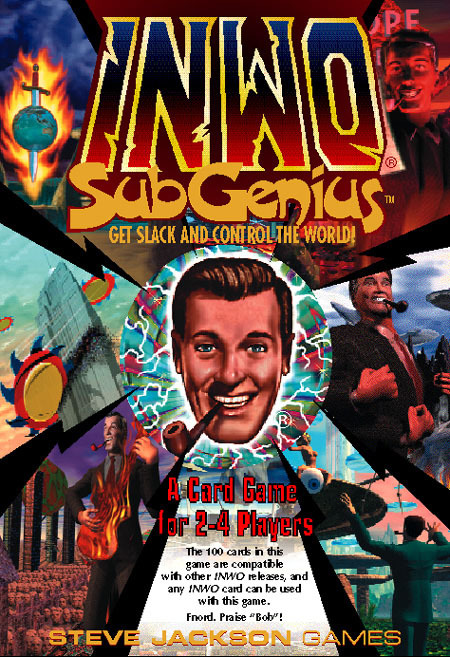 The latest INWO expansion is based on the Church of the SubGenius. This is a hundred-card non-collectible set. 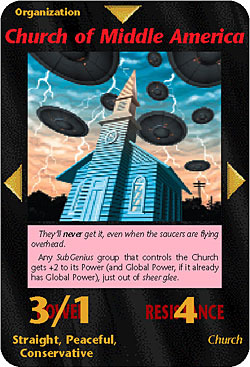 The cards feature art provided by the Church itself, and use the same color scheme as the Factory Set. (That's two of them on the left of the screen.) You will like it. 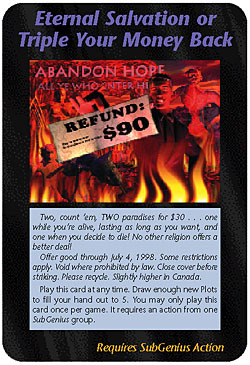 The set of 100 cards is usable by itself, and includes rules for a 4-player common-deck game, using four Church of the SubGenius cards (with different art, of course). Each represents a different faction of the Church, fighting for control, Slack, and that unending flow of dollars from the mindless Pinks. You can also drop other INWO cards into a SubGenius game, or vice versa!